Last week we explored magic, design and playing cards in Carded. This week we talk with three designers about three decks the magic world holds in high regard. Today: Curtis Jinkins and his Monarch deck from theory11. After the Q&A, designer Tim Silva provides on-deck commentary. Austin-based designer Curtis Jinkins designed the striking Monarchs, which co-starred in the 2013 heist caper Now You See Me alongside Jesse Eisenberg, Mark Ruffalo, Woody Harrelson, Isla Fisher, Michael Caine, and Morgan Freeman. How did the gig come about? Jonathan [Bayme] from theory11 saw my work on Dribbble and contacted me. It has turned into a great working relationship. What were the parameters you were given when designing the deck? There really weren’t any. We started with a size for the deck — everything else needed to be discovered. Printing techniques, paper, color palette - we had three different names before we ended up with Monarchs. At that point the graphics had to be restructured to accommodate a more “regal” theme. Take us through the design process. We started with the card backs. That’s a challenge because it has to be a mirrored image - no defined top or bottom. That design then influenced the rest of the package. There were probably ten different iterations of the box front before the final design was chiseled out. Initial plans were to redesign each face card but as these are a “casino quality” product, you can’t interfere with the standard graphics. Magicians and dealers rely on instant recognition of the royal suite. What design challenges and joys does a deck of cards present that sets the job apart from other jobs? Anything that you find ties the job to other, more traditional design jobs? People have an intimate relationship with cards, even if they don’t know it. There is a familiarity with them, a tactility and a relatively assumed aesthetic. When we started this deck there weren’t many projects that had taken those assumptions and redefined them. You have to honor the traditions and compliment them. Elegance and detail are key but you can start weaving your own story and adding unique iconography to help create something unexpected. Do you know any magic tricks and/or have any favorite card games? I can make a bag of donuts disappear. Find Curtis at Dribbble, on Twitter, and at The Neighborhood Studio. Find Monarchs at theory11. 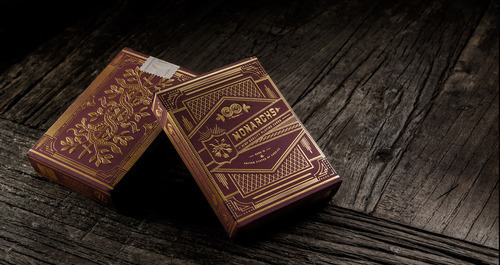 Last year, theory11 introduced a Monarchs variant deck in red. "An instant classic for daily use. This is my favorite deck of cards. I have over 750 decks in my collection that I started back in 2006. I like to mix up which cards I use every day, and these are undoubtedly with me the most. My past favorites were Bicycle 808’s, Tally-Hos, and Guardians. 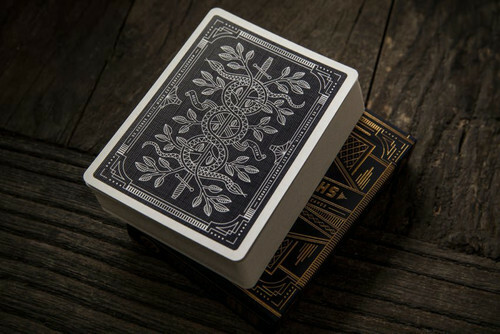 Monarchs are great for daily use because the back design of the playing cards relies on no special effects, gradients, or special inks for their beauty. It is entirely built upon fine artistry and illustration like the traditional, classic back designs. For me, the modern element of this deck is that it breathes more than past decks that sold this well in the marketplace. The white space in between the snakes, leaves, and the border is filled with the beautiful blue (or now red) color that is tiptoeing towards blackness. Unlike many other custom decks, people don’t often ask me if these are "special" or gimmicked. The visual styling is much closer to what laypeople have seen, so magicians can use these cards with confidence that their spectators aren’t assuming that it’s a trick deck. At the time of me writing this, there are rumors of an emerald green in the works; I would be thrilled to have another color of this design in my collection and daily arsenal."